As we take our Axial Yeti™ SCORE® Trophy Trucks® out to play day after day, this year, above all others, we should stop for a minute to take a look at how the truck came to be. The Axial SCORE® Truck was inspired by the full-scale trucks that have been racing in the BFGoodrich® Tires SCORE® Baja 1000, 2017 marks the 50th anniversary of this monumental event that changed the face of off-road racing. The long history of the event is surrounded by dedication and passion from its inception by the hands of the Legendary Mickey Thompson, to today’s SCORE® International organization. 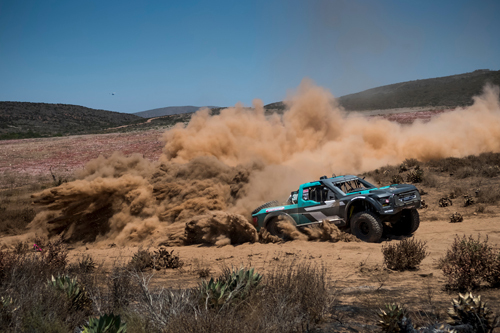 As the 50th Baja 1000 race draws near on November 12-18, SCORE® International has posted the lineage of the event along with incredible facts describing the highs, lows and background that has shaped this event to what it is today. Much, much more than just a race, history shines brightly on next month’s 50th BFGoodrich Tires SCORE Baja 1000 pre-race festivities for final round of four-race 2017 SCORE World Desert Championship includes SEMA SCORE Baja 1000 Experience, presented by BFGoodrich Tires Oct. 30-Nov. 3 at Las Vegas Convention Center; SCORE Baja 1000 qualifying for SCORE Trophy Truck at Las Vegas Motor Speedway Off-Road Track at 6 p.m. Oct. 31; Granddaddy of All Desert Races to be televised on El Rey Network. ROOTS It’s the oldest and most well known of all desert races, and it remains as the single most appealing accomplishment to a driver. Since 1967, the mother of all desert races has been run over the mysterious, majestic Baja California peninsula every year except 1974 when an international fuel crisis forced a cancellation. The SCORE Baja 1000 has captured the imagination of the entire world as entries have come not only from every state in the United States, the District of Columbia and U.S. territories Guam and Puerto Rico, but also has attracted racers from Argentina, Australia, Austria, Bahamas, Brazil, Belgium, Canada, Chile, Columbia, China, Cyprus, England, Finland, France, Germany, Greece, Guatemala, Hungary, Ireland, Israel, Italy, Japan, Latvia, Lithuania, Morocco, New Caledonia, New Zealand, Netherlands, Norway, Panama, Paraguay, Peru, Philippines, Poland, Portugal, Russia, Saudi Arabia, South Africa, Spain, Sweden, Switzerland, Thailand, Uruguay, Yugoslavia as well as the host country of Mexico. Over the years, SCORE races have been televised in more than 100 nations worldwide. STILL NO. 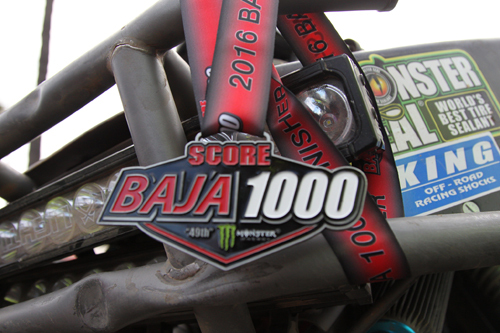 1 For the last two years, readers of USA Today newspaper have voted the SCORE Baja 1000 as the No. 1 motorsports event in the world. 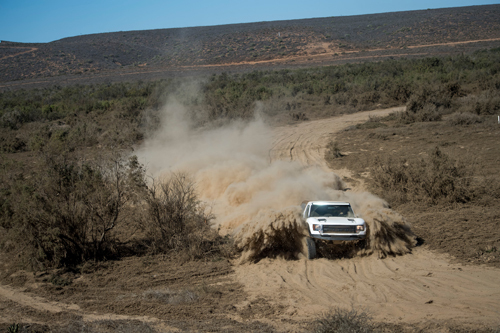 “Without the SCORE Baja 1000, there just wouldn’t be any desert racing,” said Roger Norman, SCORE International’s President and CEO. 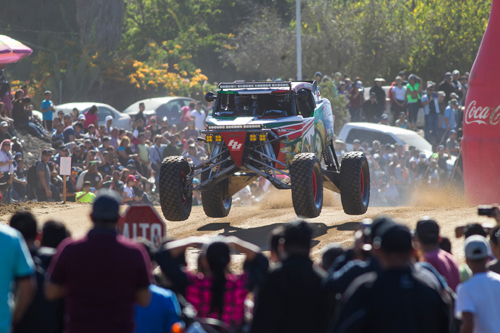 “The SCORE Baja 1000 continues to draw interest from all over the world and we now find second, third and even fourth generation racers appearing at the starting line with their family patriarchs cheering for their off-spring. This event continues to be the focal point of the SCORE World Desert Championship each year the celebration of our 50th anniversary will surely add another colorful chapter to the golden legacy of the SCORE Baja 1000.” 1967 Enthusiast Ed Pearlman founded the National Off Road Racing Association (NORRA) and established the Mexican 1000. It started officially in Tijuana on October 31, 1967 with 68 entries. They actually motored at leisure speeds to Ensenada and restarted the next day. NORRA continued to organize the Mexican 1000, which came to be known as the Baja 1000. In 1968, Pearlman moved the start of the race to Ensenada, where it stayed with one exception until 1993. In 1972 NORRA started at Mexicali and ran the first half of the race down the east coast of the peninsula through the treacherous Three Sisters section. Pre-running for this race, Parnelli Jones and Walker Evans were among a group of competitors who nearly got swept out to sea during a tropical storm. NORRA’s last race was in 1972. 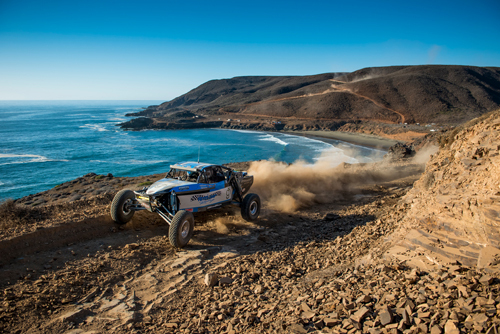 At that point, Mexican officials revoked NORRA’s permits to stage races in Baja. In 1973, a domestic group called the Baja Sports Committee produced the race. NEW BEGINNINGS After the fuel crisis of 1974 forced local officials to cancel the event, SCORE International, founded by the late Mickey Thompson and headed soon after by Sal Fish (until 2012), was invited by the northern state of Baja California to hold the race in 1975. 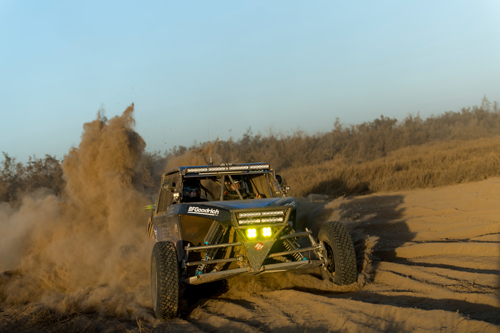 The SCORE Baja 1000 became a loop event starting and ending in Ensenada. Roger Norman purchased SCORE International from Fish on Dec. 20, 2012. In 1979, the government of Baja California Sur granted permission to resume the Ensenada-to-La Paz format and SCORE has used this route intermittently ever since. The 1979 race was notable for Walker Evans’ overall win in a Dodge truck, the first truck to win the overall title of the race. 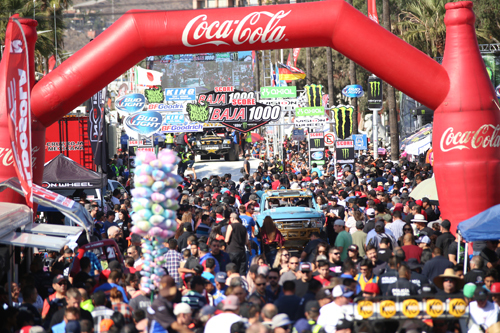 START/FINISH In its first 49 years, the SCORE Baja 1000 has started 42 times in Ensenada, three times in Mexicali (1972, 1993, 1994), twice in Tijuana (1967, 1995) once in Santo Tomas (1998) and once in Ojos Negros (1999). The legendary race has finished in Ensenada 24 times, in La Paz 20 times, in Mexicali two times (1993, 1994), twice in Cabo San Lucas (2000, 2007) and once in Ojos Negros (1999). FAMOUS The famous and not-so-famous have tried their hand at conquering the Baja and they have come from all walks of life. Mark Thatcher, son of Great Britain’s then-prime minister Margaret Thatcher, raced in the 1982 SCORE Baja 1000. Celebrities James Garner, Ted Nugent and the late Steve McQueen all battled the Baja in the early 1970s and many racers from other forms of motorsports crossed over to try their skills. Among the drivers from other arenas who have tested the Baja were Indy Car racers Rick and Roger Mears, Parnelli Jones, Danny Ongias, Danny Sullivan, Jimmy Vasser, Buddy Rice, Sebastien Bourdais, Oriol Servia, Roberto Guerrero, Michel Jourdain Jr., Johnny Unser and Mike and Robbie Groff, NASCAR’s Robby Gordon, Jimmie Johnson, Boris Said and Brendan Gaughan, SCCA legend Elliot Forbes-Robinson, World Rally Championships’ Armin Schwarz, Armin Kremer, Andreas Aigner and Harri Pavanpera,, world motorcycle champions Malcolm Smith, Larry Roeseler and Destry Abbott, Motocross legends Ricky Johnson and Jeremy McGrath, XGames star Travis Pastrana, drag racers Don Prudhomme and Larry Minor and legendary SCORE founder and motorsports innovator Mickey Thompson. The late Academy Award winning actor, racer and race team owner Paul Newman raced in the 2004 event. Jesse James, of ‘Monster Garage’ fame, and Hollywood film and TV star Patrick Dempsey both have raced in this classic several times. LEGENDS This year’s race will commemorate the achievements of legendary desert racers like Rod Hall, Ron Bishop, Johnny Johnson, and Larry Roeseler. Hall, who will turn 80 on Nov. 22, has a record 24 class wins (including one overall win in 1969), and is the only racer who has competed in all 49 SCORE Baja 1000 races. Bishop was the only racer who competed in the first 40 SCORE Baja 1000 races all on a motorcycle. Hall will be racing this year in the Stock Full class with his son Chad Hall as he attempts to add to his untouchable legacy. Bishop, now deceased, was the only racer who competed every year of the first 40 on a motorcycle. Johnson, now retired, had 15 class wins, amazingly in eight different classes. Roeseler, has won 17 times in this race, including 13 overall wins (10 on a motorcycle). Roeseler will share driving duties this year in SCORE Trophy Truck with Luke McMillin in the No. 83 Ford F-150. Roeseler won the unlimited Class 1 for four consecutive years (2004-2007), driving with the youngest of three racing brothers, Troy Herbst, in the Smithbuilt-Ford open-wheel desert race car that was known as the ‘Land Shark’. Roeseler is the only racer in the history of the event to win the overall 4-wheel in a truck and also in a car as well as the overall 2-wheel title as well. In 2008, Roeseler split the driving with driver of record and team owner and now SCORE owner Roger Norman when they were the overall 4-wheel and SCORE Trophy Truck champions and the pair was second in 2009. In 2010, Roger Norman drove solo the length of the peninsula and finished third overall. Special history was also made in 2010 when the father/son team of Gustavo Vildosola Sr and Gustavo ‘Tavo’ Vildosola Jr, of Mexicali, drove to the overall 4-wheel and SCORE Trophy Truck victory to become the first Mexican nationals’ team to win the legendary race and it was a peninsula run from Ensenada to La Paz. SAME SIREN Lured by the same siren that enraptured the Ekins brothers in the 1950s, the SCORE Baja 1000 remains as the No. 1 target of adventurers the world over, not to mention the cadre of pro and semi-pro desert racers who consider it the fitting climax to their racing season each year. THIS YEAR-SPLIT-START Commemorating the first race, motorcycle and quad classes will start at midnight (PT) on Wednesday, Nov. 15 and the car, truck and UTV classes will begin their journey in the elapsed-time race 10 hours later at 10 a.m. (PT) on Thursday, Nov. 16. While the fastest vehicles are expected to complete the course in approximately 20 hours, all vehicles will have 48 hours from the time each starts to complete the course and become an official finisher of the 50th anniversary race. 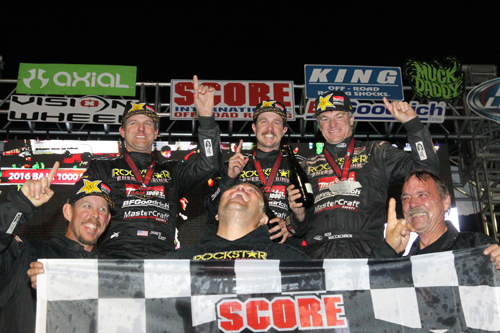 THE WHO The royalty of desert racing will be in this year’s field and leading the way will once again be the marquee SCORE Trophy Trucks, the SCORE-created class for high-tech, 900-horsepower unlimited production trucks. There are already 37 SCORE Trophy Trucks entered in this year’s celebratory race. Among the entries in SCORE Trophy Truck are No. 11 Rob MacCachren/Jason Voss, No. 1 Carlos ‘Apdaly’ Lopez/Juan C. Lopez, No. 77 Robby Gordon, No. 31 Andy McMillin/Tavo Vildosola, No. 97 B.J. Baldwin/Rodimiro Amaya, No. 15 Billy Wilson/Chad Bunch, No. 4 Justin Matney/Josh Daniel, No. 23 Dan McMillin/Gary Weyhrich, No. 19 Tim Herbst/P.J. Jones, No. 7 Bryce Menzies, No. 83 Luke McMillin/Larry Roeseler, No. 91 Troy Herbst/Brett Sourapas, No. 3 Mark Post/Ed Herbst/Kyle LeDuc, No. 9 Armin Schwarz/Eduardo Laguna, No. 16 Cameron Steele/Cody Stuart/Pat Dean/Rene Brugger, No. 14 Cameron Steele/Cody Stuart/Pat Dean/Rene Brugger, No. 41 Justin Lofton/Matt Loiodice, No. 76 Jesse Jones/Austin Jones/Toby Price, No. 21 Pat O’Keefe/Mark McMillin, No. 5L Clyde Stacy/Jeff Geiser (SCORE TT Legend class) and No. 21L Gus Vildosola Sr/Rodrigo Ampudia Sr/Scott Bailey (SCORE TT Legend). THE WHERE To date, there are 206 total entries from 34 U.S. States, two U.S. Territories and 19 countries officially signed up to compete. In addition to the United States, the U.S. Territories of Guam and Puerto Rico and the host country Mexico, the other countries with racers entered are Australia, Austria, Canada, Chile, Costa Rica, England, Finland, France, Germany, India, Israel, Italy, Japan, New Zealand, Peru, South Africa and Spain. WHO ELSE BUT SAL! Sal Fish, 78, the iconic desert racing promoter who owned SCORE International for 38 years, will be the Grand Marshal for November’s 50th BFGoodrich Tires SCORE Baja 1000. Off-Road Motorsports Hall of Famer Fish, who lives in Malibu, Calif., has earned more awards in his life than most racers have won races and was the face of SCORE from 1974 until he sold the company to Roger and Elise Norman on Dec. 20, 2012. A graduate from the University of San Francisco, Fish had risen to the top as the Publisher of Hot Rod Magazine when Mickey Thompson, who founded SCORE in 1973, recruited Fish to be the President of SCORE. DUST 2 GLORY From award-winning documentary filmmaker Brown, ‘Dust 2 Glory,’ scheduled to premiere nationwide on Dec. 6, chronicled each of the four races in the 2016 SCORE World Desert Championship. Brown’s original Dusty to Glory, released in 2005, became an iconic classic showcasing the legendary SCORE Baja 1000. 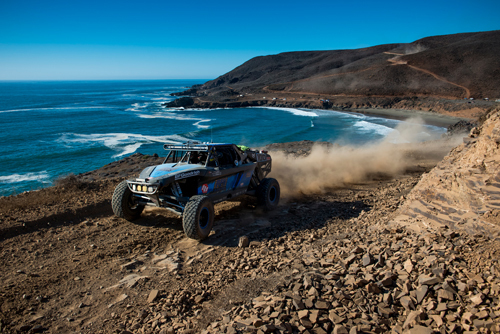 D2G, which began shooting at the 2015 SCORE Baja 1000, continued up close and personal coverage capturing the robust racers in their amazing adventures in Mexico’s majestic Baja California peninsula through all four spectacular 2016 races. Executive Producer is BCII’s Bud Brutsman. Tickets for the special, one-night Dec. 6 nationwide premiere will go on sale on Oct. 23. For information regarding tickets and theater locations, visit https://www.fathomevents.com/events/dust-2-glory. EL REY NETWORK The four-race 2017 SCORE World Desert Championship in Baja California, Mexico along with the SEMA SCORE Baja 1000 Experience/SCORE Baja 1000 Qualifying in Las Vegas are all airing on El Rey Network in the United States. International distribution is by way of syndication. 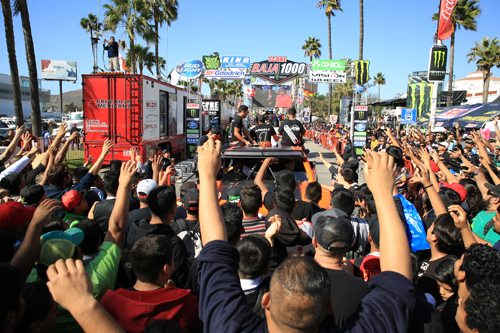 The season-ending 50th SCORE Baja 1000 will have a two-hour show produced while the other race shows are each one-hour telecasts. El Rey Network is available in 45 million homes across the country through cable and OTT providers and via satellite on DirecTV Channel 341 and Dish Network Channel 253. For more information on how to watch El Rey visit http://elreynetwork.com. SCORE SPONSORS… Official SCORE Sponsors: BFGoodrich Tires-Official Tire & Official Race Title Sponsor, Monster Energy-Official Energy Drink, King Shocks-Official Shock Absorber, RACELINE Wheels-Official Wheel, Axial R/C-Official R/C Vehicle, El Rey Network-Official Television Partner, Wide Open Excursions-Official Arrive and Drive Company, Crystal Bay Casino-Official Casino. SCORE Official Partners: PCI Race Radios, 4 Wheel Parts, The Satellite Phone Store, Satellite Del Norte, Instant Mexico Auto Insurance, CETTO Vineyards. Additional SCORE Associate Partners: Proturismo Ensenada, Baja California Secretary of Tourism, Baja California Sur State Government, Baja California Sur Secretary of Tourism, Mexicali Ayuntamiento, COTUCO Mexicali/San Felipe, Cruz Roja Mexicana, Corporate Helicopters, McKenzie’s Performance Products, Advanced Color Graphics. Tijuana SCORE Desert Challenge Special Partners: XXII Ayuntamiento de Tijuana, Baja California Secretary of Tourism, Tijuana Comite de Turismo and Convenciones, Comite de Marcadotecnia Turistica, Asociacion de Hoteles del Noroeste. For more information regarding SCORE, visit the official website of the SCORE World Desert Championship at www.SCOREInternational.com.